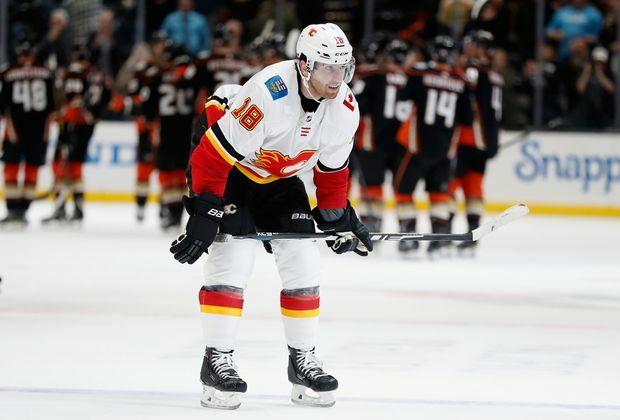 James Neal of the Calgary Flames looks on after being defeated by the Anaheim Ducks 3-2 in a game at Honda Center on Nov. 7, 2018 in Anaheim, Calif.
Ryan Getzlaf scored 27 seconds after Calgary got a tying goal in the third period, and the Anaheim Ducks beat the Flames 3-2 on Wednesday night. The Flames trailed 2-0 in the first but rallied to tie it six minutes into the third on Mark Jankowski’s short-handed goal. Getzlaf then was able to corral a loose puck in front of the goal and directed a backhand through Mike Smith’s legs for his second game-winner of the season. Anaheim got on the board at 8:37 of the first when Silfverberg carried the puck into the Calgary zone and ripped a slap shot for his fifth goal of the season. Henrique gave the Ducks a two-goal lead three minutes later when he pounced on a rebound after Smith stopped Josh Manson’s shot from near the blue line. With less than three minutes left in the first, Calgary scored on the power play when Tkachuk redirected Elias Lindholm’s drive past Gibson. Jankowski tied it when he stole the puck from Anaheim’s Brandon Montour in the neutral zone and shot it just over Miller’s glove while leading a 2-on-1 rush. Notes: Anaheim D Jacob Larsson got an assist on Silfverberg’s goal for his first NHL point. Larsson was the Ducks’ first-round selection in the 2015 draft. ... Ducks are 3-1 during the second game of back to backs ... Tkachuk has a point in four straight games with two goals and four assists. ... Lindholm’s assist extending his points streak to six (three goals, six assists).